SO you’re already familiar with the streets of Bangkok and perhaps driven to Hatyai for a weekend of food and shopping. You’ve been to Thailand’s best island destinations and even spent long weekends at those breathtaking beach resorts. Perhaps you’ve even scaled through the mountainous province of Chiang Mai and Mae Hong Son. What’s next, then? Enter the floating villas of Thailand. The concept of overwater villas is not something new but has been recently put under the spotlight with new properties opening in some of the most exotic regions of Thailand. Think of the floating architecture of the Lexis Hibiscus Port Dickson with the setting of Ha Long Bay; expect a lot of interaction with nature as you allow your mind to wander in the tranquillity of surrounding waters. Floating communities are also common sights in Thailand, with many floating markets and water villages scattered around the country. In fact, Bangkok was once known as the Venice of the East, with canals that crisscrossed the city serving as key transportation routes. At that time, most residents lived on water. Bangkok was once known as the Venice of the East, with canals that crisscrossed the city serving as key transportation routes. Perhaps for city dwellers, it’s a respite to return to simpler ways of living, so book yourself a trip to one of these overwater villas in Thailand. This beautiful resort comprises the main overwater premise and a cluster of floating straw huts surrounded by emerald-green water. The beach-fronting dining area makes a romantic evening with your loved one. If you’re feeling adventurous, you can go kayaking, diving and snorkelling. There are also Thai boxing classes and cooking demonstrations for those who want to immerse themselves in traditional Thai culture. There are only 15 private villas available in this luxurious floating ark-like sanctuary. The quasi-futuristic architecture has no resemblance to tropical or Thai influences but a rather Nordic approach that suggests a meditative vibe. Catch the glorious sunsets over the open water from the comfort of your room. The rooms are also equipped with life jackets, so even if you cannot swim, you can still take a dip in the river. 500 Rai Floating Resort is located in Khao Sok National Park, Southern Thailand. 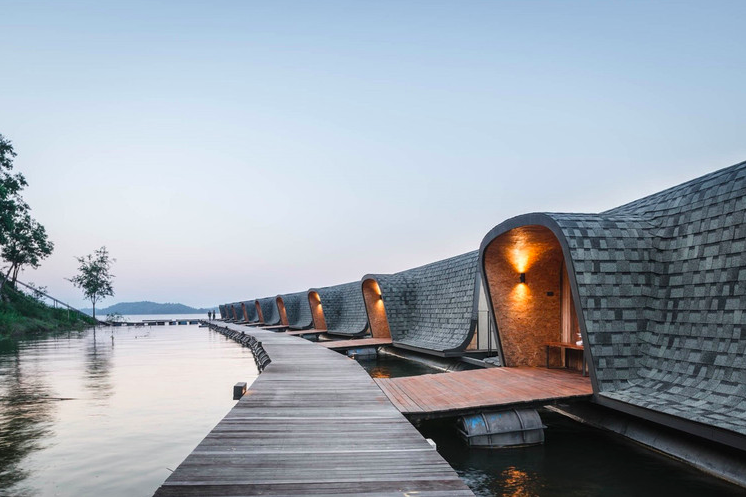 11 overwater villas carefully line the edge of Chiewlarn Lake amidst one of the world’s oldest forest. Enjoy magical views of the sunset as you sit back and relax on the floating cabanas in front of your villa. There are plenty of activities for you to do including a tour around the wilderness for bird watching and spotting wildlife. Situated on the scenic Ratchaprapha reservoir in Suratthani, The Greenery Panvaree is the first air-conditioned floating resort in Thailand. The resort is tucked in a private location surrounded by deep emerald green waters and limestone mountains. There is also a beautiful coral cave just 15 minutes away from the resort. Dubbed the ‘Guilin of Thailand’, The Greenery Panvaree is the perfect getaway for those who want to just switch off from the hullabaloo of the city. If you want to be close to nature but still have the facilities and convenience of a luxury beach club, KC Resort & Over Water Villas will be your choice. Perched on Koh Samui’s white sandy beach, the somewhat ‘floating’ resort is just minutes away from shopping and dining hotspots. Each villa comes with its own private ‘waterscape’ in a cascading fashion. Admire the stunning views of Chaweng Bay and the sapphire Gulf of Thailand from the infinity-edge private pool. Tucked in the peaceful nature reserve at Sri Lanna National Park, Mountain Float is a private floating resort with only four houseboats available. Each villa comes with two bedrooms and is great for large groups. Enjoy water activities like kayaking or zorbing, or simply lounge in the water pods and let the day pass by. Accessible only via water taxi, Mountain Float is considered one of the best-kept secrets in the mountains of northern Thailand. This article was first published on LifestyleAsia.com.